Josh Moreman scored the winning goal for Peterborough Sports at Market Drayton. Two goals in the final 20 minutes enabled Peterborough Sports to break their losing streak in Division One South of the Evo Stik League. Sports had lost their previous six matches before making the long haul to Market Drayton today (November 25). And it looked like a less-than-magnificent seven was on the way when the home side took the lead just past the half hour mark.. 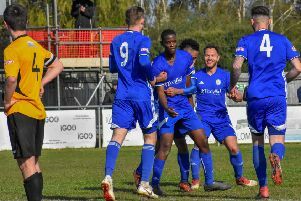 But Lewis Hilliard equalise on 70 minutes and Josh Moreham claimed a winning goal 11 minutes from time to lift Sports up a place to 18th, and crucially seven points clear of the one relegation place. Spalding are a team in need of a positive result. It’s five defeats in a row for the team in 14th after a 2-1 loss at Belper. The home side were 2-0 up five minutes into the second half before Jonathan Lockie pulled a goal back with 20 minutes to go. Stamford’s scheduled game at Leek was postponed because of a waterlogged pitch. Division One South: Belper Town 2, Spalding Utd 1 (Lockie), Market Drayton Town 1, Peterborough Sports (Hilliard, Moreman).